Morning! I recently found out there's painting by numbers for adults as well, and I couldn't resist giving that a go! I remember them from when I was a child, I don't think I did them often, but from what I recall they were usually animals and had a plastic white frame, and they never turned out the way the were on the box, lol! But luckily the adult version turned out good :) I still have plenty acrylic paint left, so decided to go for a mani with a bunch of the green colors. 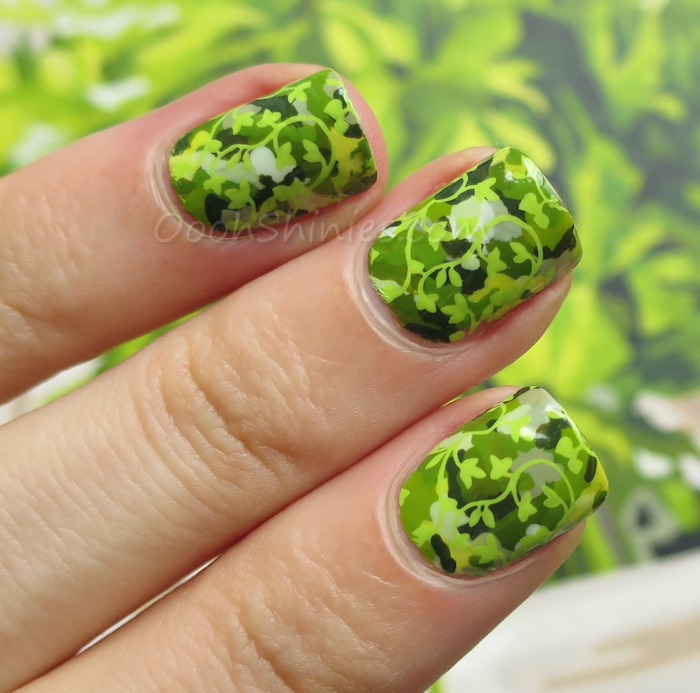 I didn't really have a plan in my head, but it turned out like some sort of messy camo plants. Yeah, that sounds about right! Here's a pic I showed on Instagram before, when I just started the first herb and was still quite overwhelmed by all those tiny spots! Well, at least it gave me plenty good practice with a small brush, so at least my right hand should be better with nailart brushes now, heh. And here's how they turned out :) The gold frames shown on the box weren't included (you can purchase them seperate, but they're not really my taste), I'll probably go for white or wooden frames. If you're also interested in doing this, this set was from a brand called Schipper and I was pleased with the quality. But there's only 1 brush included, so I ended up buying some more! 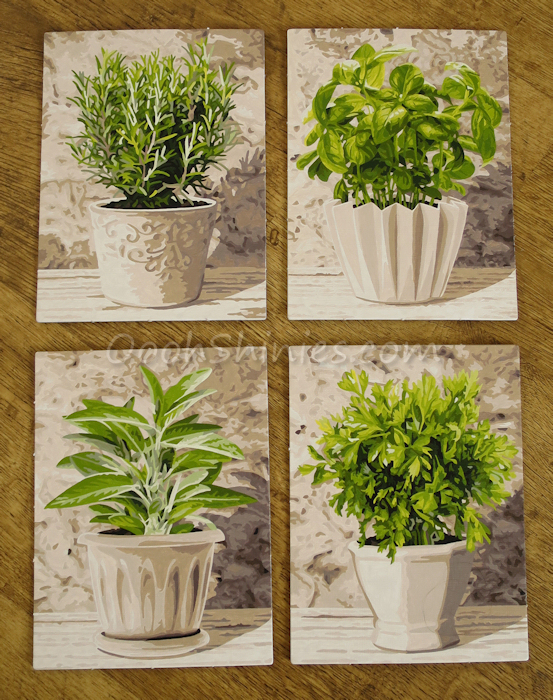 The paintings are done on cardboard with a linen structure, and the size of these (18x24cm each) made them easy to turn around and work from different sides. The backgrounds are more beige/brown than most images on Google (they showed more grey), but I like this more, it looks warmer. Here you can see a little of the paintpots in the background, I have 24 colors on 4 strips of pots. They're small pots though, so I worried if it would be enough for all the paintings, but I didn't finish a single one and I have so much left of most! 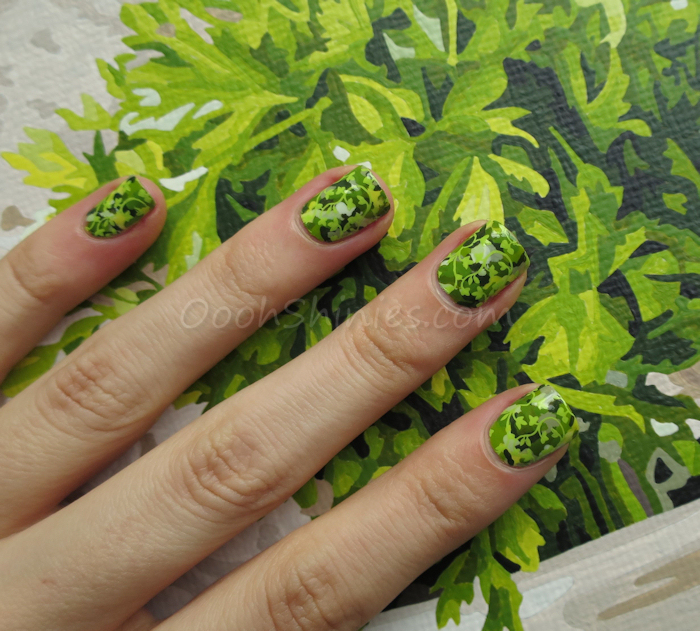 Basecoat with acrylic paint stamped with Mundo de Uñas Lime and Born Pretty Store plate QA27.